Photo © Bruce Melton, 2012. The shift in awareness is very encouraging and seems quite likely to be more or less permanent because the number of unprecedented weather events will very likely continue to increase. AUSTIN, Texas — Polls, surveys and academic evaluations of public opinion are showing a shift in our collective understanding of climate change. Since the turn of the century, belief in the causes of and reality of climate change has fluctuated wildly at levels below those seen in the 1990s. Some of this change has been caused by political cues. These are the messages that we get from our leaders and interest groups motivated to “advertise” their message. Change in awareness is also caused by actual climate extremes. Because the extremes are here to stay and there is a growing distrust of the “voices” that advertise the message being disproven by the extremes, the increasing change in awareness is grounds for a shift in advocacy policy towards how we urge for climate change action. In a 2008 report, George Mason University says that only 60 percent of climate scientists believed that Earth was warming in 1991, compared to 97% today. Public understanding of climate issues was fair to poor until the Bush Administration came into office and awareness significantly declined. But President Clinton is not blameless because he first failed to do something about Senate Resolution 98 (in 1997) that refused to ratify the Kyoto Protocol, and for four more years did not sign. Bush’s subsequent failure to sign and then his premeditated campaign to derail international climate change policy work gave Americans permission to deny. The United States was the only country in the world except for Afghanistan and South Sudan that did not sign Kyoto. Beginning in 2005 we saw a string of unprecedented blizzards in the northeastern U.S. and northern Europe. The cold weather convinced many that climate change was indeed as the voices were saying, and that they could continue to disregard the message from scientists. In 2009 more political cues penetrated the media deeply with the theft of climate scientists’ emails and attention being drawn to a single error in the 2007 IPCC (Intergovernmental Panel on Climate Change) Report (Known as Himalayagate) — and a slanderous campaign discrediting the 2007 IPCC reporting on the Amazon was faulty (Amazongate). 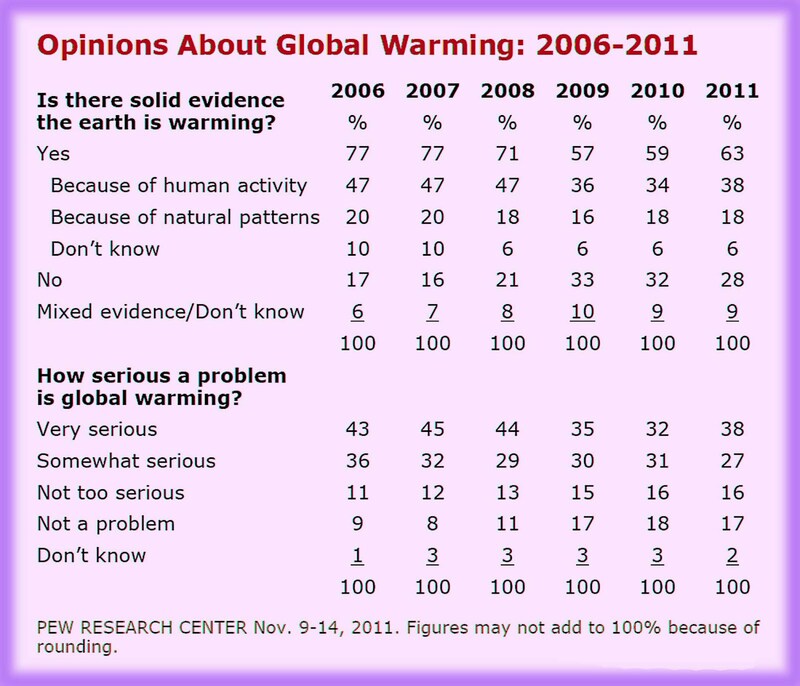 The climate science community hoped things would change with Obama’s election in 2008. His message about climate change, although with muted action, was radically different from the Bush Administration’s message. Political cues had radically changed across the country and even the failed Copenhagen Summit kept climate change in the news and was laying the foundation for a change in awareness. In 2010 it finally happened. The press was paying attention to scientific findings showing that blizzards and snowtastrophes were associated with an unprecedented weather pattern in the Arctic, caused by climate change, sending abnormally severe winter weather far south on a berserk jet stream. For 20 years, the vast majority of climate scientists have been warning us that changes like these would happen if we did not reduce our emissions. We did not and they did. Now these same scientists (and more) are warning us that the extremes will continue to worsen even if we do stop all emissions, and a longer delay means more danger than otherwise. The message is getting through. The Yale study tells us that over the past several years, Americans say the weather in the U.S. has been getting worse rather than better by a margin of over 2 to 1 (52% vs. 22%). The National Climatic Data Center tells us that 14 weather disasters costing more than a billion dollars each (inflation adjusted) happened in 2011. This is 56 percent more than the previous record of nine set in just 2005 and three times as many as the average of the last decade (4.8 per year, 3.8 in the 1990s). About half of all Americans say that heat waves (53%), droughts (46%) and very heavy rain storms (43%) have become more common in their local area over the past few decades. 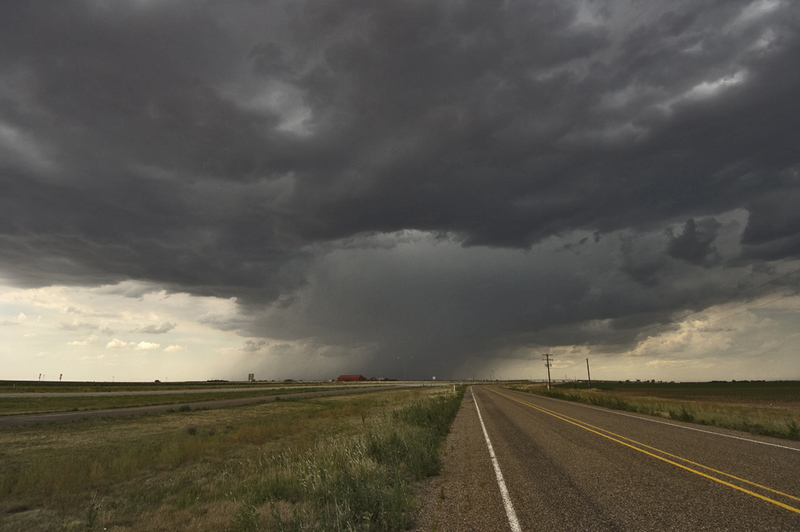 People in the Northeast and Midwest are more likely to report that heavy rainstorms have become more frequent in their local area, while people in the South and West are more likely to report that droughts have increased. Many Americans also say that extreme weather has increased the occurrence of other problems in their local area, including harm to crops (46%), floods (39%), problems with air quality (38%), forest fires (34%), problems with water quality (31%), and problems with transportation (23%). People in the Northeast and Midwest are more likely to report that local floods and harm to crops have become more frequent, while people in the South and West are more likely to report that forest fires in their local area have become more frequent. 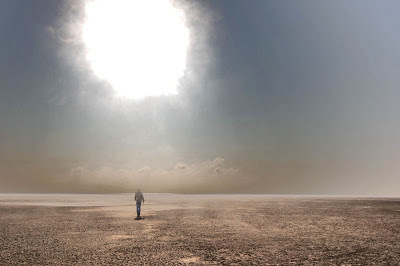 The shift in awareness is very encouraging and oddly, even more encouraging is the concept that the shift seems quite likely to be more or less permanent because the number of unprecedented weather events will very likely continue to increase. 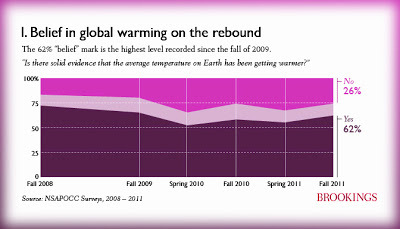 The Brookings Institute tells us the change in awareness began in the spring of 2010. 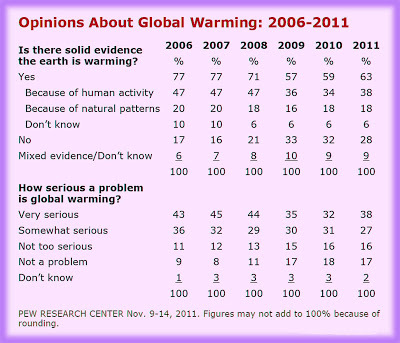 Americans’ environmental priorities have shown global warming at the very bottom since at least 2004. But it’s the relative position of the issue that counts, however (and of course the other issues being measured). 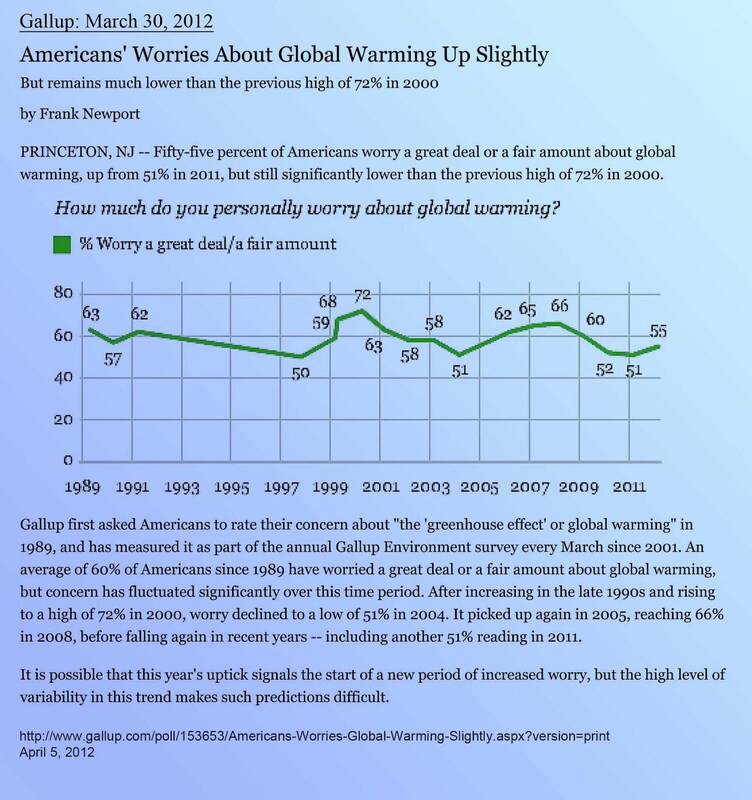 When we compare March 2011 to March 2012 we see that those who “worry a great deal” about global warming have increased 5 percent to 30 percent. The lowest it has ever been in this record that dates back to 1989 is 24 percent in 1997. 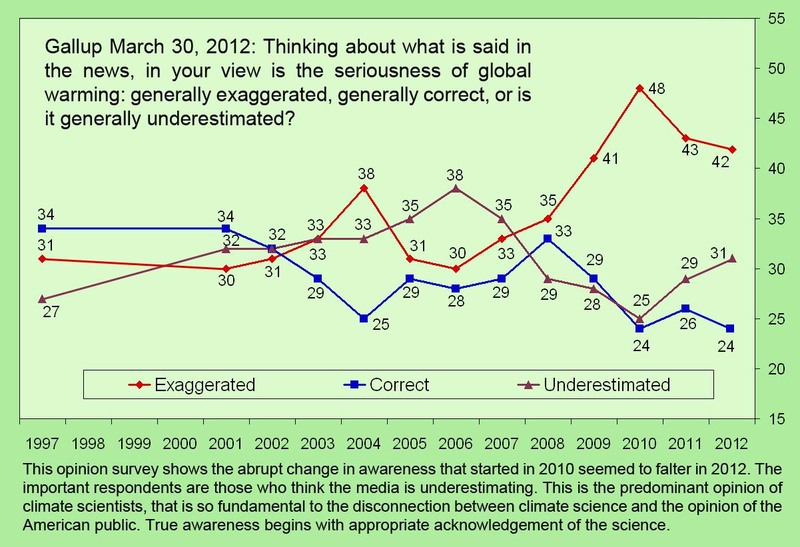 Gallup’s 1997 to 2011 poll about public belief in the seriousness of global warming shows a 4 percent increase from 2010 to 2011. Pew shows a 6 percent increase in the belief that evidence is ”solid” from 2010 to 2011. Rasmussen is up 4 to 6 percent since 2010. 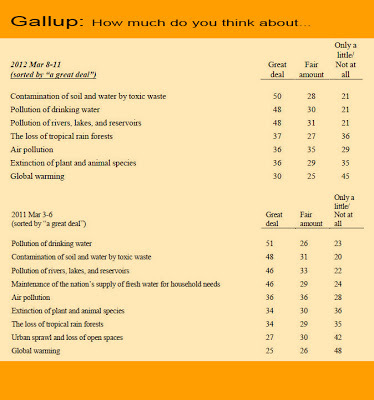 Another Gallup poll from 1989 to 2011, about how much individuals personally worry about climate change, is also up 4 percent in 2011. The Brookings Institute shows a 10 percent increase in the belief of solid evidence showing Earth’s temperature has been getting warmer in the 18-month period between spring 2010 and fall 2011. 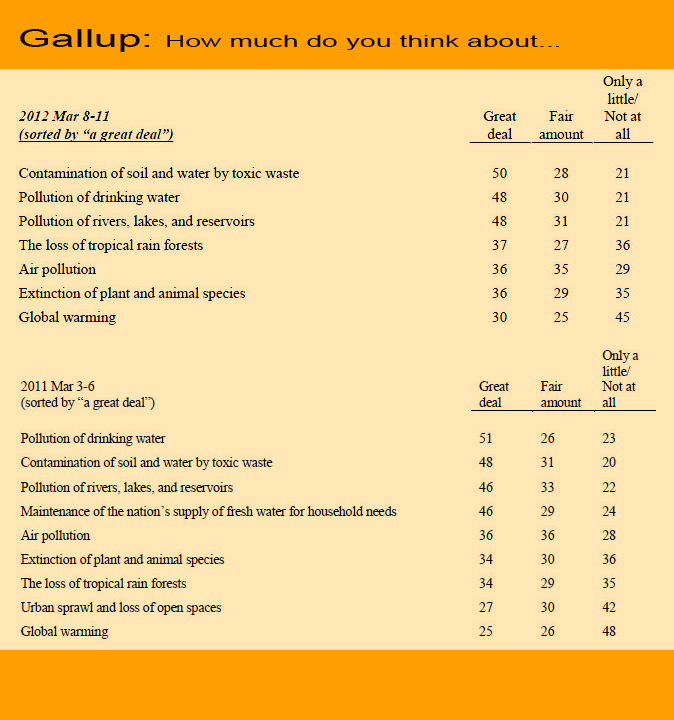 And finally, once again looking at Gallup’s long-term list of Americans’ environmental concerns, global warming is still on the bottom but that five point increase from 25 to 30 percent is a 20 percent increase in one year. Overall this is a solid 3 to 5 percent annual increase (or more), which is a very healthy change in overall public perception. Considering that this rate will likely increase, in just two or three years public sentiment could be at an all-time high. Nonbelievers out there would say my evaluation is one-sided or cherry-picked and that I should be looking at “other” sources of information and that public belief is a consequence of the climate scientists’ or government conspiracy. So looking at the three major treatises of the dissenter groups, the most astonishing is the Oregon Institute of Science and Medicine Global Warming Petition Project with signatures of more than 31,000 scientists. The petition was mailed with an op-ed article from The Wall Street Journal and a manuscript in a format that is nearly identical to that of scientific articles published in the Proceedings of the National Academy of Sciences. The NAS Council would like to make it clear that this petition has nothing to do with the National Academy of Sciences and that the manuscript was not published in the Proceedings of the National Academy of Sciences or in any other peer-reviewed journal. [the NAS statement goes on]. The petition does not reflect the conclusions of expert reports of the Academy. This “petition” contains signatures of over 13,000 medical doctors, engineers, and general science majors. Many, if not all, of these good folks could be qualified to say something about climate science, but are they? Generally, expert opinion in science is relegated to those with advanced degrees in specific disciplines. Engineers and medical doctors do not practice fundamental science, they apply fundamental science. There’s a big difference. Scientific American took a random sample of 30 of the 1,400 signatories claiming to hold a Ph.D. [of the original 17,000] in a climate-related science. Of the 26 we were able to identify in various databases, 11 said they still agreed with the petition — one was an active climate researcher, two others had relevant expertise, and eight signed based on an informal evaluation. Six said they would not sign the petition today, three did not remember any such petition, one had died, and five did not answer repeated messages. As an example of the lack of control in who signs this petition, there are 10,102 in the category of general engineering and general science broken down into I) Engineering (7,280), II) Electrical Engineering (2,169) and III) Metallurgy (384), and General Science (269). Not included in the engineering category are 223 nuclear engineers, 2,169 electrical engineers, 1,693 chemical engineers, and 2,637 mechanical engineers. Over half (16,555) of the signatures are from engineers. Are engineers capable of understanding climate? Sure. I am an engineer. Are engineers represented in the academic literature publishing about climate? The answer is a resounding “no.” To finish with the Oregon Petition; it includes 81 food scientists and 384 metallurgical scientists. 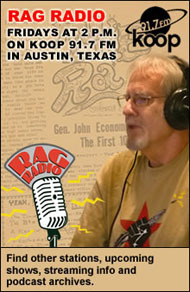 Climate Change Reconsidered is an 880 page report prepared by the Marshall Institute and co-authored by Fred Singer. The opening remarks of the original video press conference of this 2009 report on their website primarily refers to the 31,000 “scientists” of the Oregon Institute Petition as their scientific support. The header on their website tells us to “Learn the Benefits of Atmospheric CO2.” Singer is an 83-year-old physicist who made a name for himself studying clouds. Singer also made a name for himself fighting against the anti-smoking movement and he was outspoken against regulations to curb acid rain. 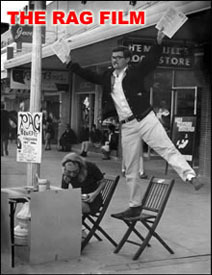 Then he fought against global protection for the ozone layer. Emailgate, Himalayagate, Amazongate, etc. : Theft of personal emails; a single error about Himalayan glacier among thousands of facts in the 2007 IPCC Report, and a Scribner’s citation error about the Amazon are resources that have been considered. The email scientists have been cleared of all charges by four separate independent investigations. As for public opinion, there are certainly other sources of information on public opinion that I have not cited, and many of them say the same thing that I have reported, like the Public Religion Research Institute. But then there are those sources like The Heartland Institute or the George C. Marshall Institute that have carried out long and expensive campaigns to discredit. When the Heartland Institute compares those who believe the consensus position on climate change to the Unabomber, a line must be drawn. Rush Limbaugh and the talking heads on Fox News use similar crude tools to frighten and attempt to discredit with their “message.” This is not something that happens in credible science. To conclude part one of this series, the relatively recent increase in unprecedented weather extremes has shaken up an increased public apathy towards climate change that has been prevalent since about the turn of the century. 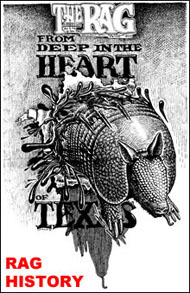 The opinions of the dissenters are well established, prominently advertised, and look enormously authoritative, but they lack hardly any credibility. Climate scientists have been warning us that weather extremes would happen sooner if we did not reduce emissions. We did not and they did. 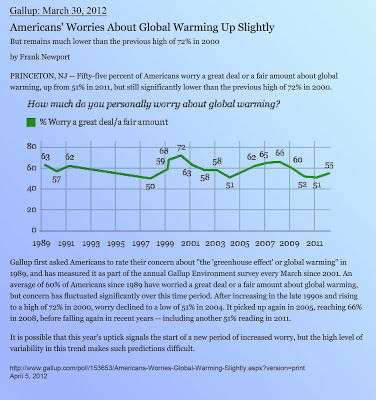 The American public has broadly taken notice, blamed the unprecedented nature of these weather extremes on climate change, and this is represented by numerous public opinion polls, surveys, and recently published academic work. It’s time to ramp up the discussion. 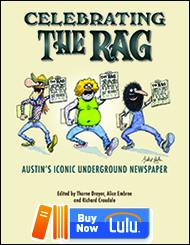 This entry was posted in Rag Bloggers and tagged Bruce Melton, Climate Change, Climate Science, Environment, Global Warming, Public Opinion. Bookmark the permalink.